Track your rankings inside Mobile Search apps and see how different Mobile Web search results are, compared to search results inside Mobile apps. By now, every SEO Professional knows that Mobile Web is eating Desktop Web, and Mobile Apps are eating Mobile Web. For example, a recent report by the Local Search Association showed 89% of all users start their searches not just on mobile, but specifically in Mobile Search Apps. As a Search Marketer, if you’re still using “Old SEO” Tools that are dependent on data that is ultimately derived from web-based keyword search, you’re seeing a completely skewed view of the market. With the amount of time consumers spend in Mobile Apps, where Search results are very different, and very often those search apps aren’t even plain old “Google” (think Yelp, Maps, etc) – you could be missing out more than 50% of all daily search activity! 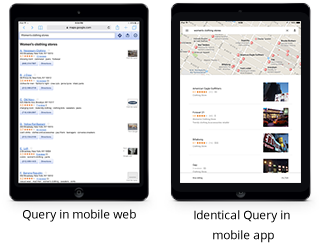 See what your businesses look like inside Android & iOS native search apps, record & analyze data from screenshots of the App Results Pages (ARPs), and identify where you are winning organically, where you need to increase spend or introduce a paid campaign.